Texas Governor Rick Perry has officially proclaimed today "Entertainment Software Day" in Texas. Hint: by "entertainment software" he probably means videogames. Guess "Videogame Day" didn't sound official enough, but we'll take this anyway. In a first for the United States, February 3, 2009 (that's today) has been officially proclaimed "Entertainment Software Day" in honor of the contributions of Texas-based videogame developers to the state's economy and culture. 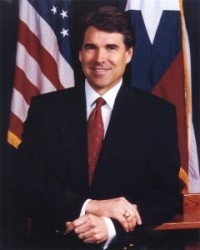 Governor Perry's proclamation coincides with the passing of resolutions in the Texas legislature recognizing the value of the games industry in Texas. The resolutions were spearheaded by Senator Bob Duell and Representative Dawnna Dukes, who have previously worked to secure financial incentives for game developers in Texas. "The support of Governor Perry, Senator Duell and Representative Dukes for the entertainment software industry in Texas is an endorsement of the artistic and economic contributions our industry has made to the state," Mike Gallagher, the CEO of the Entertainment Consumers Association, said. "These lawmakers are helping grow our industry as we work to create new jobs for Texans; boost the state's economy; and help discover new ways computer and video games can improve the ways Americans live, work and play." The Texan games industry has certainly earned a day in its name. According to the ECA, it adds $395 million to the state's economy. So, Texans, how will you be spending your official Videogames Day? Maybe play some Doom II in honor of Texas' own id Software? Go ahead, take the day off work or school. Tell your boss or teacher the governor said it himself, today is Videogames Day, I can leave and go home, crack open a can of Game Fuel, munch on some Pringles and eat some Haagen Dasz while I play some Gears of War 2. It's doing this state some good.